The weekend of January 26/27, 2019 we will be updating our web site to have more features and be compatible with all devices. Congratulations to Colin Smith on his first solo!!! Congratulations to Chris Grodzinski on his first solo!!! Congratulations to Jake Meder on his first solo!!! Congratulations to John McKnight on his first solo!!! Congratulations to William Ridgeway on his first solo!!! Congratulations to Jacob Sadl-Kolchetski for Successfully completing his Private Pilot Flight Test!!! Congratulations to Mike Hayes on his first solo!!! Congratulations to our Instructor Mathew Keezhaymannil on upgrading to a Class3 Instructor June 10, 2017 · Congratulations to Sean Kessler on his first solo!!! Future Air has a proud history, starting 16 years ago with a vision of providing the best quality Flight Training in the Collingwood and Barrie area. Since its inception Future Air has trained hundreds of people for their Recreational, and Private Pilot Licenses. As well as Night and VFR over the Top Ratings. We have been providing the best quality flight training in the Collingwood and Barrie areas since 2000. We currently operate out of two location. At the Collingwood Regional Airport we operate 2 Cessna 172 aircraft and out of the Lake Simcoe Regional Airport we operate 4 Cessna 172 aircraft. 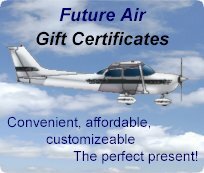 If you would like to start flight training, Future Air offers a Recreational Pilot Permit course, Private Pilot License course, Night Rating, VFR Over the Top Rating, and Instrument Rating. Future Air has the highest experience Flight Instructors in the area; this ensures you learn quicker and more efficiently. Don’t be fooled by other claims of being the best. Choose the knowledge and experience that Future Air has to offer! Future Air also provides Scenic, Sightseeing flights of the local area. If you are interested in seeing the uniqueness of the Georgian bay area there is no better way than from the air. We operate 7 days a week 362 days a year.